Escape the daily grind and join us on a summer holiday to the Spanish Island of Mallorca. We are staying in the adults only 4* THB Gran Playa hotel, in the lovely resort of C’an Picafort, on the island’s north coast. Our hotel is located in the centre of the popular resort of C’an Picafort, on the island north coast. The resort has a very chilled out atmosphere, which is perfect for a relaxing beach holiday. Just like many of Mallorca’s resorts, C’an Picafort has grown from a small fishing village into a well-established tourist resort. The beach is just 50m from our hotel and it strikes the right balance between a beautiful blue flag sandy beach lapped by clear warm Mediterranean waters with its equal measures of varied daytime activities and nearby refreshments. At night we can venture out from the hotel to find a small yet varied selection of bars, with a range of Brit bars as well as a few karaoke bars to keep us entertained in the evenings. If you choose to take a break from relaxing by the poolside and have a beach day instead, C’an Picafort Beach which is just 50m walk from our hotel is the place to be. It stretches for over 3km and boasts white sand and a long promenade lined with bars and restaurants. There is a range of daily entertainment and organised sports activities that take place on the beach for those of us that are brave enough. Alternatively, why not take a walk along the long promenade which is a fun place to see fellow walkers, cyclists and roller bladers. There is also a weekly market by the promenade that is geared towards holiday makers – the perfect place for us to grab some souvenirs, perfect for those who like to have a go at haggling! Away from the sun loungers, the surrounding area has a lot to offer. The coastal resort of Alcudia offers a lovely marina with a range of dining options to choose from. Further afield, Palma which is an hour’s drive away is another option where we can enjoy the authentic atmosphere of a vibrant Spanish City. 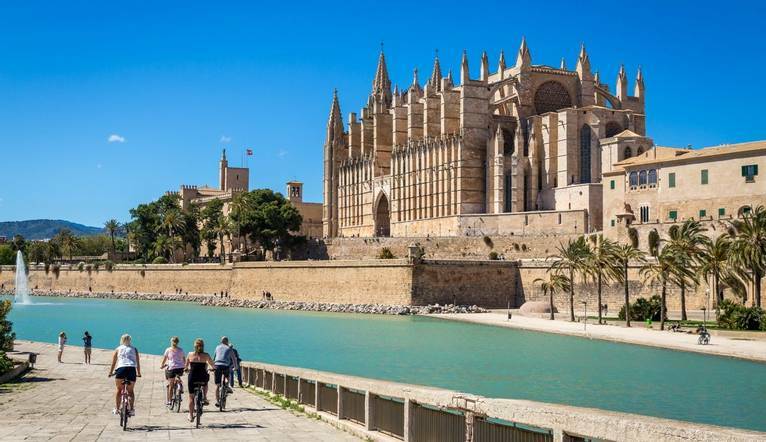 We can enjoy shopping in a wider range of shops and boutiques or visit Palma Cathedral. On the hill overlooking the seafront, its Gothic architecture is accentuated by its beautiful stained glass windows, creating a warm, colourful glow when inside the building. Our adult’s only hotel is located in the center of Ca’n Picafort, and just 50m away from the beach, offering a calm and pleasant atmosphere in which the quality of service and friendliness is its philosophy. Transfer time from Palma airport to the THB Gran Playa is approximately 50 minutes depending on traffic. You may wish to take an optional excursion during the course of your stay. Full details will be given at the Information Meeting. All tours should be paid for in euros. The exact amount will be given at your Information Meeting. Your Tour Leader will help arrange these for you but may not necessarily accompany you.